Gypsy Strip Adhesive is specially formulated for use with Gypsy or Ardell lashes. This adhesive holds strip lashes securely in place. Note: This is the exact same adhesive as Ardell LashGrip. The packaging may contain LashGrip Adhesive. Gypsy Strip Lash 90 Black are full, lush and beautiful natural style lashes. Full volume, moderate to full length, with a subtle criss-cross design.Please note, newer packaging Gypsy 90 lashes may say Gypsy 900 on the tray; this is just a number change, the style remains the same. 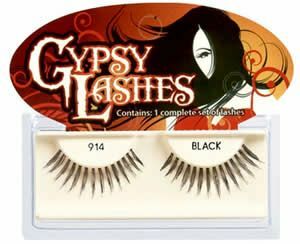 Gypsy Lash 91 Black Ply Fine add just the right length and volume for any look. These very dense lashes provide full volume and moderate length. This lash style is similar to Andrea Modlash #33. Please note, newer packaging Gypsy 91 lashes may say Gypsy 901 on the tray; this is just a number change, the style remains the same. Comparable to Bullseye BILLIE lashes. Gypsy Strip Lash 92 Black Fanny Lash adds subtle, yet incredible length to your natural lashes. This lash style is similar to Modlash #62. Please note, newer packaging Gypsy 92 lashes may say Gypsy 902 on the tray; this is just a number change, the style remains the same.